Student, Samson Snyder, speaks with McDonough Plumbing about careers within the company and training opportunities. Sarasota FL. (October 31, 2017): CareerEdge Funders Collaborative announces the completion of another “express” training course with the graduation of 16 individuals in Manatee Technical College’s pilot program in Plumbing and Electrical service. 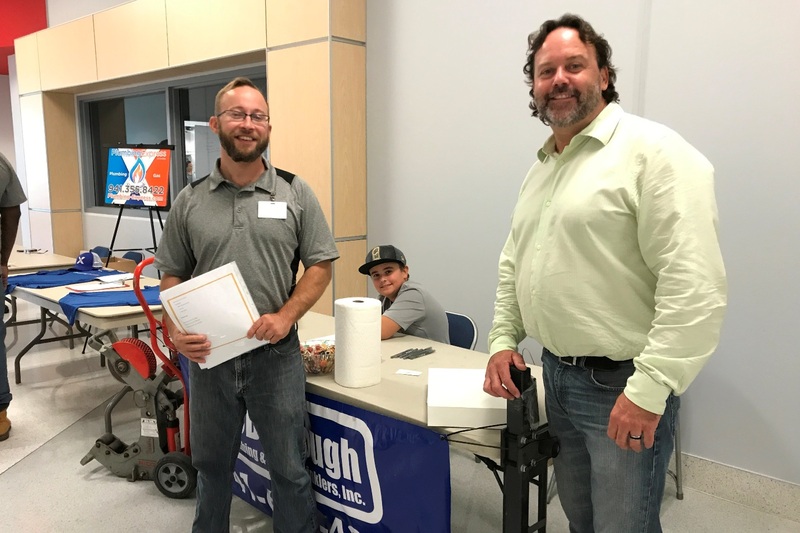 Given the high demand for skilled workers in our region, CareerEdge is partnering with local educational institutions to provide short-term programs in order to quickly move individuals into apprenticeship-based occupations in the trades. 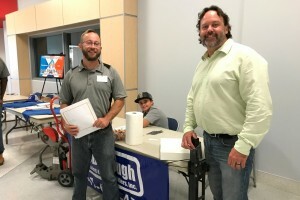 CareerEdge partnered with Manatee Technical College on the Plumbing and Electrician programs by helping to recruit individuals, providing funding for the courses and offering a soft skills training for the students. Graduates of the 3-month program receive certifications in the following industry-recognized credentials: NCCER, CPR, Forklift and OSHA. “MTC is thrilled to partner with CareerEdge to help meet the talent needs in the community. Getting to know the students and seeing the impact they will have in the community is uplifting,” explains Manatee Technical College Business Services Director Martha Meyers. Starting wages for these entry-level plumbing and electrical technician positions are approximately $15 per hour, with average wages between $40,000 and $50,000. At the end of the program, CareerEdge organized a job fair with 10 local employers participating in the recruitment of the students. The next cohort of express programs will begin in January 2018, with a daytime Plumbing class and an evening Electrical course. To learn more about upcoming express programs at Manatee Technical college, please contact Martha Meyers at 751-7900 X1022. CareerEdge is an innovative partnership of business, government, and philanthropic organizations that leverages public and private dollars to provide opportunities for better jobs and wages in Manatee and Sarasota counties. The first regional collaborative of workforce investors in the southeastern United States to be designated as a site of the National Fund for Workforce Solutions, CareerEdge was created with funding from the John S. and James L. Knight Foundation, City of Bradenton Central Community Redevelopment Agency, Gulf Coast Community Foundation, Bank of America, Bradenton 14th Street Community Redevelopment Agency, Bradenton Downtown Development Authority, and Manatee Community Action Agency. It is also supported by contributions from the Charles and Margery Barancik Foundation, Microsoft, Sarasota County Government, Jane’s Trust, JP Morgan Chase, Scheidel Foundation, Foundation for a Healthy St. Petersburg and United Way Suncoast. For more information about CareerEdge and its partners, please visit www.careeredgefunders.org or call 941.328.6985. Manatee Technical College is a postsecondary career and technical education center with four campuses within the School District of Manatee County offering over 50 career preparation programs, continuing education, adult general education, and personal enrichment classes. Manatee Technical College is fully accredited by the Council on Occupational Education. The mission of MTC is to meet the ever-changing needs of our communities and the workforce by producing highly skilled individuals and resourceful leaders through collaborative education.